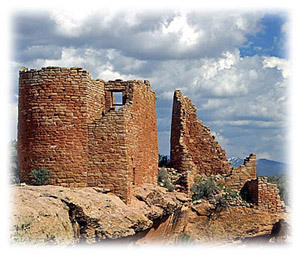 Hovenweep, is famous for its square, oval, circular, and D-shaped towers. Square Tower site is easily accessible, with a nice hiking trail and visitor center. Other more remote sites are possible for the more adventuresome. To get a taste of more archaeology, take the back road home and visit Lowery Pueblo, the site of a Great Kiva. Obtain directions at the Hovenweep Visitor Center.